For those of you that are in Georgia and have ANY sense of timing, you’d know that the 2018 Georgia General Assembly session is upon us. We convene on Jan. 8th, 2018 at 10:00 am, per our state Constitution. And we will meet up to forty (40) days per our constitution, although not consecutively. Sidenote: Did you know the Georgia constitution happens to be one of the longest in the nation behind Texas? That’s not a compliment folks…. Anyway, I am in my 4th term or 8th year as a member of the Georgia House of Representatives. My! How time flies when you are having fu…..well, not having much fun since I am in the minority party. Although, that’s an upgrade because I used to be a member of the SUPER minority party until recently but I digress. During my time in the legislature, I have seen my law degree, my undergraduate communications degree AND my M.B.A. all serving me well in terms of persuasion with others. But it doesn’t take degrees to understand the art of persuasion when it comes to influencing your lawmakers. And let me take this personal point of privilege to STRONGLY encourage you to pester your lawmakers as much as you can and hold them accountable. But aside from that, don’t let the media tell you only paid lobbyists are the ones that persuade legislators. I assure you that is NOT the case. Citizen lobbyists are some of the most persuasive people I know. They are passionate. They are pithy (which is important). And most importantly, most of the time they are my constituents, which is of the highest priority for me. Point No. 1: Tell the whole truth and nothing but the truth. I am looking for whole truths and not half truths or puffed up lies. There are competing interests on every piece of legislation so eventually the truth will get back to me. So, to avoid my rage and your embarrassment, just be upfront about the whole situation in the process. If you can accurately convey the pros and cons of your argument, you would have gained the respect of me as a legislator and as an attorney. I mean, attorneys…most of them anyway…like facts and knowing all of the arguments. So perhaps this is why I put the most emphasis on this persuasion point. Point No. 2: Give me data. I love data. You can lie about a number of things—-but numbers don’t lie and neither does the data and conclusions that come from those numbers. I am particularly a fan of charts and infograms. It helps me digest the millions of information I receive each session. So take that load of information, numbers and data and put it into a form that is easily digestible and distinguishable among the piles of paper that sit on my legislative desk everyday. But remember when you are giving out that data to refer to point no. #1. That’s important. Point No. 3: Think about those I represent. The majority of constituents I represent are middle age, African American females with 2.5 kids and a post graduate degree from DeKalb and Gwinnett counties. Relate your position to how it affects MY district specifically. If you can combine points number 1, 2 and 3 you have hit the jackpot as far as I am concerned! I know as a citizen lobbyist that can be a daunting task. Indeed, I know it would be hard to specify your argument based on 180 distinct House district—-but it goes a LONG way in persuading me. I need to know the impact on those I serve and it’s easier to get me to your position if you can tell me how it affect those 54,000 Georgians I serve. Point No. 4: Advise where the bill is in the process. Seriously, don’t talk to me about a bill that hasn’t even had a 2nd reader. Or hasn’t been assigned to committee. Or has been assigned to a committee I don’t serve on. Or has no chances of seeing the light of day. Why? We vote on thousands of pieces of legislation which means thousands more have been filed. I need to focus on the forest as opposed to the trees—specifically the forest that is ahead of me and not the trees behind me. It’s a waste of both of our time to discuss bills that are far on the horizon. In fact, I will forget what you told me by the time the bill becomes relevant anyway. It takes a little patience but prioritizing your arguments are the best way to get my full attention when I have a million other things on my mind. And I can talk competently about it when it is in my radio. And THAT is a win-win for all of us! Point No. 5: What’s in it for you? It’s an honest question and one I think, as a lawmaker, I am entitled to know. I don’t judge motives; only outcomes. However, knowing motives does allow me to determine how I process information coming from someone. If the answer is “because I am being paid by a client” or “this affects me personally”, fair enough! I am a lawyer. I have clients. I know what it means to have a duty to zealously represent a client. I’m not mad. But be honest. We are all humans so self-preservation is a thing…a real thing…a thing none of us should hide from. Now, some of my colleagues won’t appreciate the honesty but I do. Where there you have it! My 5 points for how to personally persuade me, Dar’shun Kendrick, the State Representative from House District 93. I hope that this list will be helpful as we embark on the 2018 Georgia General Assembly session. It is my particular wish that each of you reading this blog post will put these skills to use and come visit me at the “velvet rope” outside Chambers. Need more “hands on” training and expertise? Then I have THE workshop for you, hosted by my private business Kendrick Advisory & Advocacy Group, LLC. Tickets are VERY limited so I hope you will join me, others and pitch expert A.C. Chan to learn more about the art of “pitching” and persuasion. The best part—I will be there since it’s my program so you can try your “pitch” out on me. You can’t get better beta testing than that so join me! NOTE: This workshop is a part of KAAG’s signature lobbyist training program, the GA Path Program, designed to expose minorities and women to careers as professional Georgia lobbyists. This program is in its first year of operation with twenty (20) members of the Inaugural class. I am Chief Diversity Activist and Consultant for Kendrick Advisory & Advocacy Group, LLC. Visit us online to request me as a speaker, set up a time to chat about your diversity goals or view upcoming events. a nonprofit dedicated to educating and empowering minorities on how to access capital to grow their business and create generational wealth. 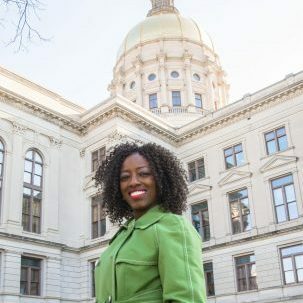 I have been elected to the Georgia House of Representatives since 2010, serving over 54,000 Georgians in DeKalb and Gwinnett countries under the Georgia State Capitol each year.